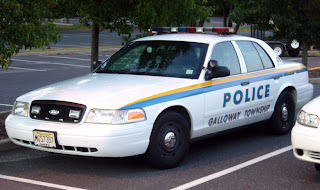 GallowayTwpNews.com has obtained an email sent by Shop Steward Kevin Welsh to six Galloway Township Police Officers in reference to a grievance that was filed by the Mainland PBA Local #77. The grievance was filed in order to challenge a decision made by Chief of Police Patrick Moran in reference to the Corporal promotion made in January 2013. Although the Officers filed their grievance on grounds of what was purported as procedural issues, those issues were throughly reviewed with the final decision by the PBA to withdrawal the grievance as of Wednesday, March 20, 2013. We have released the content of the email below. As a closing explanation to the grievance, Welsh stated in his email to the six officers, "while I understand some of your frustrations regarding the promotions and the promotional procedures followed, no matter which scenario is followed, in my opinion and the opinion of the PBA, the outcome will be the same. While it is understood the Chief carries enough points on the test to control the outcome, at least using the current procedure and test, there are other factors taken into consideration. The question is do you really want the Chief to have an outright carte blanche to pick who he wants? And for the record, the Chief is aware of his authority to do just that." The grievance filed by several officers came on the heels of five officers retiring effective December 31, 2012. Lt. Davey, Lt. Dooner, Sgt. Midgette, Cpl. Goldberg and Cpl. Bird were the five officers who resigned. Chief Moran requested Township Manager Arch Liston to "at a minimum" fill street sergeant's position and the corporal's position. According to an email sent to members of the Police Department by Chief Moran on January 11, 2013, "Manager Liston has indicated to me that he would backfill the rank structure at a minimum of replacing Sgt Midgette's position; however, he believes that the Township is not in the position to do so due to budget issues." Moran further stated in his email, "an e-mail was sent to Council advising them of our recent stats along with a request for supporting rank structure that includes the street sergeant and corporal to which 6 council members replied advising they supported the request." This request and the additional final approval by Township Manager Arch Liston, of which we have confirmed, led to the two promotions in January 2013. That statement made by Moran, was a question of concern listed in the PBA email by Welsh stating, "Subsequent to the filing of the grievance, another question arose regarding whether or not Council had taken formal action at a Council meeting to approve the 2013 promotions. Claims were made that no such formal action took place and that the approvals for the promotions were garnered through e-mails and/or phone calls and as such violated the Open Public Meetings Act." Councilman Jim McElwee stated in an email request for comment, "I did reply to Chief Moran's e-mail on Jan. 9th. I consider my response as a vote of confidence for him and the department in light of the sacrifices his ranking officers made in choosing to retire, averting any layoffs. That's different from approving the promotions which is up to the Manager and Council to decide. I did not consider his e-mail or my reply as an OPMA violation. I did not know in advance that the promotions were going to occur. When I spoke to Arch Liston in person after receiving the e-mail, he told me it was not in the Budget. Later at a Council Meeting it was discussed." Mayor Don Purdy confirmed in a phone interview that he also replied in support of the Police Department and Chief Moran. The PBA's decision even with the question raised concerning a potential OPMA violation knowing the PBA would only have 45 days to challenge in court, Welsh stated, "If we were successful, the Courts in the past have told management to "do it again the right way" so as a result the Council could just do it over or more likely, to avoid additional litigation, just negate the promotions and let the Chief do a new policy to allow him to promote Corporals." Moran stated in his email to Council on January 9, 2013, that because of budgetary issues, "the department was threatened with layoffs and demotions." Moran further stated, "Five (5) ranking officers retired to help save the department from this type of devastation and saved the Township approximately $682,000 in salaries, social security payments, and health care." With additional negotiations the PBA agreed to an accelerated contribution rate for Health Care and the saved the Township an estimated $178,000 in savings for insurance and lengthened the contract steps which saved $111,000. Nineteen individuals also opted out of insurance which was an additional estimated savings of $342,000 for 2013. A total savings as estimated by Moran was $1,313,000 provided strictly from the Police Department. It is unclear as to what the total dollar amount is the Police Department was required to save in order to meet the 2013 budget, including the surplus left from the savings in order for these promotions to occur. Chief Moran was unable to provide those figures and deferred comment to the Township Manager. Moran further requested based on those savings, to backfill the street Sergeant's position which also lead to the replacement including the promotion of one officer to Corporal. Moran stated, "although there were two people promoted, there was actually only one position filled and there were six (6) supervisor's positions." The Police Department even with the retirements, has struggled to maintain their bottom line number of officers needed to ensure the day to day operations and safety of the community. As of recently, the Police Department advertised for additional SLEO Officers. Officers according to Moran, "are a great and economically sound way to assist our officers, especially with court and transporting prisoners." On March 18, 2013, Township Clerk Thalia TC Kay swore in Przemyslaw Ryba, one the Township's SLEO Officers to now be a permanent Police Officer. According to an email sent by A/Chief Allan Kane on March 14, 2013, "we are expecting to pick up Ryba next week as a full-time officer to help out for the remainder of the calendar year. I hope that we will be able to retain him as we go into 2014." Moran has also recommended in his email to Council, the promotion of his single Lieutenant to Captain. A promotion according to Moran in a statement today "has not been made yet." According to Payroll records, the last remaining Lieutenant is Chris Doyle. The total dollar amount in which the Police Department was required to reduce for the 2013 budget was not immediately available. Moran deferred the question to the Township Manager as "the original estimated numbers were different than final numbers because of unexpected costs etc." Additional officers promoted were done so for the purpose of backfilling an already devastated ranking structure. The claims brought forth by the PBA's initial grievance, were essentially withdrawn without the added cost of mediation and litigation. The results of the claims including those of the alleged OPMA violation will remain unknown as the PBA did not opt to challenge the alleged violation in court. The Police Department, as allotted in the budget, continues to promote and hire officers as necessary in order to serve the Public and provide the required standards of Safety to the community. So they saved $1.3 million...Great. How much of that has been spent back promoting and hiring? Do the math...how much has REALLY been saved? These officers are ALL on the hook for more concessions and the bottom ones HAVE to be smart enough to know they WILL be looking at LAYOFFS. If they don't, then they aren't worth their salt as trained and reasonable investigators. Did those suckers really NEED to retire? Looks like MAYBE 2 or 3 would have sufficed. Does this kid HONESTLY think he has a position in 2014? Surely some are 'doing (ALOT) more with less' but CLEARLY some are 'doing (ALOT)LESS for MORE $$$'. Does their union have ANY principles? Maybe this publisher should do a little more homework before posting an INCOMPLETE article. I do not disagree, however, you can't squeeze blood out of a stone. The Chief did not know the math on how much he was required to cut vs. how much was true savings in surplus that allowed for the additional expenditures ie. promotions and new hires. I can't take a fictitious number and throw it out there. The homework isn't Incomplete, taxpayers should be asking the questions to their elected officials who approve the budget as to where they are allowing this money to come from. Until the budget is introduced and dissected line item by line, you still will not find the answer of the money trail. So, let me ask a question here. You just hire a much needed officer but make it known you don't know if you can keep him next year. So why on earth would you even consider promoting your only Lt to Captain?? So he can get a $15,000 raise?? Where's the benefit there?? You had only one Captain for years but now you need a second?? Why can't you keep him a Lt and bank the much needed $15,000 and keep an extra guy on the street where he's needed?? I would ask the editor here to pose this question to Mayor and Council, the Police Chief and the Twp Manager. The Township rather see one guy get promoted then potentially keep an officer??? Are we stupid?? and isn't this the same Lt who is named three times in a pending lawsuit to include sending an email making a racially disparaging statement?? What's wrong with this picture?? These recent promotions make no sense. This money should be saved to keep officers. The chief only promotes his friends or relatives. This is why Galloway is in such poor financial shape. Poor leadership making poor decisions.